To compensate for the lack of both a car and a driver's license, all you need is a reasonably sized camera backpack, a Toute Gare Belge ticket from Thalys and the willingness to get up early in the morning. A few hours later, but still early in the morning, I arrived at une gare Belge and fired off a quick text message to my partner in crime for this weekend to let him know that I had arrived. The response was a short and confusing "I know". After a bit of straying around, we finally met to discuss our plans. Or rather the fact that we, as usual, didn't have a plan. We decided to just march into the nearest abandonment we could think of. And as usual, access was not possible. But this was Belgium after all, so we just took the next best place. Back in school, when everybody was pretending to study French, I preferred to pretend studying Latin. Still, I have managed to pick up a few phrases. "Access interdit" for example means something like "Enter here". 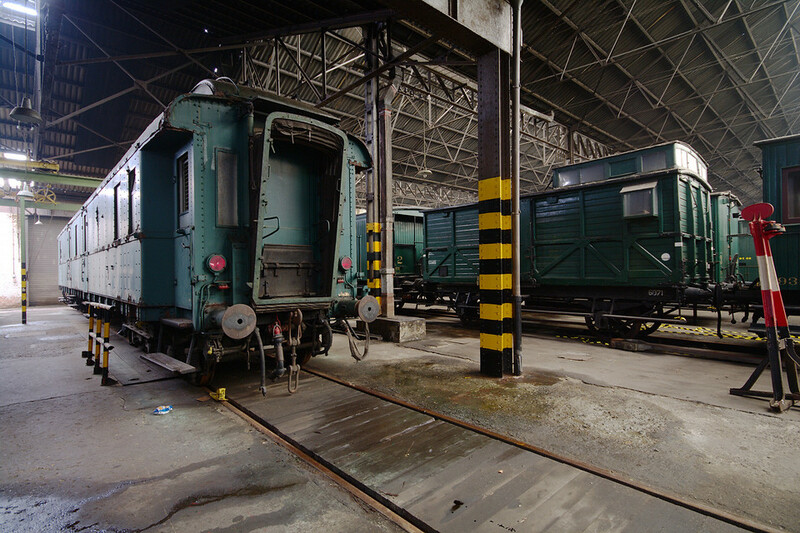 A parked police van provided valuable cover for hopping a fence and after some more crawling and climbing, we found ourselves standing in the middle of a semi-abandoned train depot. 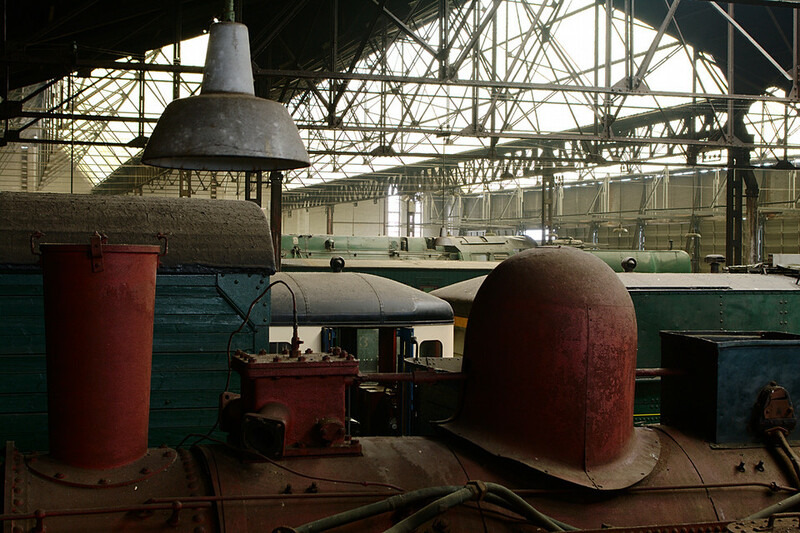 The place was packed with literally tons of steam era train carriages and actual steam locomotives, most of them looking ready to go to a museum. I'm not much of a train nerd, but I remember as a kid the closest I would get to a real steam locomotive was behind barriers in museums. I would have killed for the chance to climb around wherever I wanted because nobody was watching. 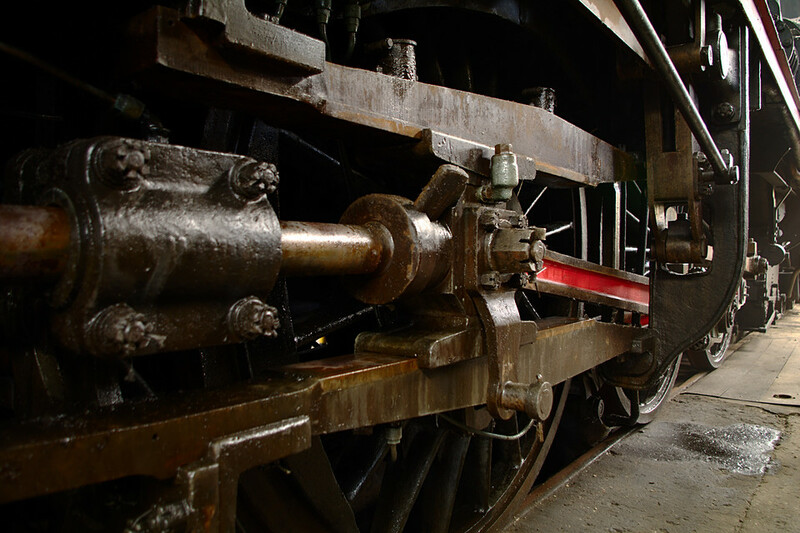 Historical trains have a very distinct spirit to them. Instead of the clean and polished look on modern trains, they are made from bare iron, held together by very obvious bolts and having little irregularities and glitches all over the place. It portrays a sense of roughness and force that one completely misses out on when gliding over the landscape in a "modern" train like the Thalys. 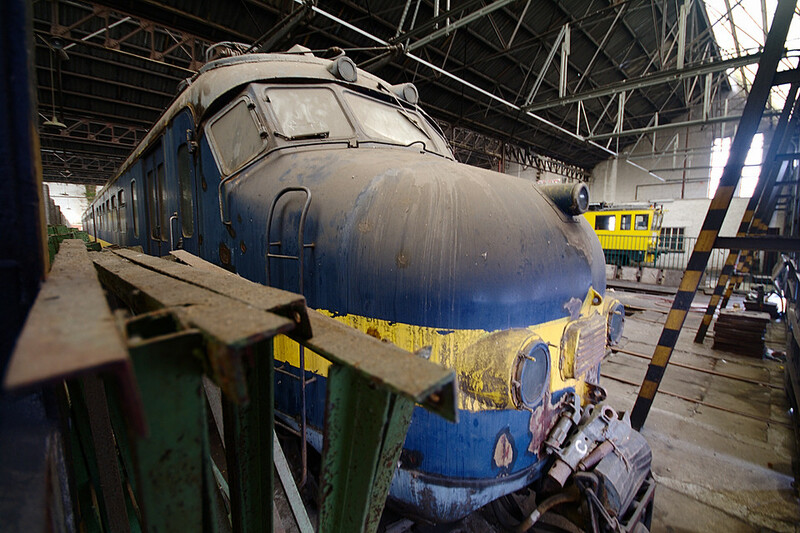 The old trains certainly made the place appear like a graveyard. And while there may not have been souls to be disturbed, we remained as quiet as possible. Because, even though it was a rainy Saturday afternoon, the place was not really abandoned. Separated by a man-high, very thin concrete wall, a railway crew rolled in on their yellow work train. Luckily, they didn't stay too long and we could sneak back out relatively easy while it was slowly getting too dark to take decent pictures.